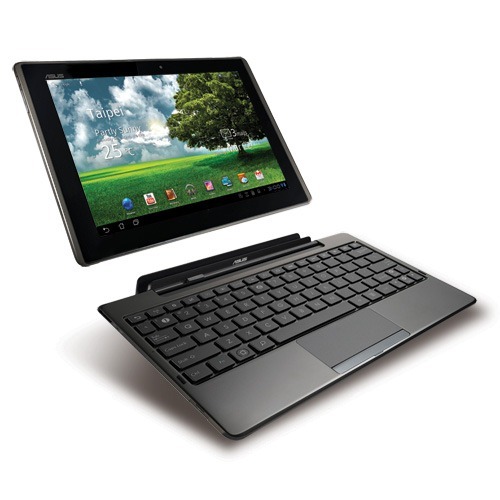 At $400, the Asus Eee Pad Transformer has the lowest price of any Honeycomb tablet. Also, its high-quality screen and relatively cheap keyboard/dock make it an attractive option. Disappointingly, the Eee Pad Transformer without its keyboard dock accessory doesn’t have a full-sized USB port or even a micro USB connector. The only ports on the tablet itself are a standard headphone jack, a mini-HDMI port (for connecting a high-definition TV or projector), a microSD card slot, and a proprietary ASUS connector that doubles as a USB and charging port. Though the proprietary connection is a pain, it offers two benefits: it connects the tablet to the keyboard dock, and charges much faster (around one hour) than a regular micro USB charger. On the right side are the microSD card slot, a Mini-HDMI port, a microphone pinhole, and a headphone jack. On the left are the power/lock button and volume rocker. The bottom houses the 40-pin connector for charging the battery or connecting to a PC for data transfer, but unfortunately, no USB port is included. This is may be an intentional oversight that may incentivize the purchase of the keyboard/dock accessory. Attempting to properly connect the keyboard to the tablet can be a highly frustrating experience. There are no markers to assist you in lining up the two pieces, and you essentially have to slide the tablet around until you feel it connect. Also, in order to get the tablet to lock into the dock, we had to push down fairly hard on it.